﻿ Atletico 1-1 Real Madrid. Two points dropped or one pointed rescued? 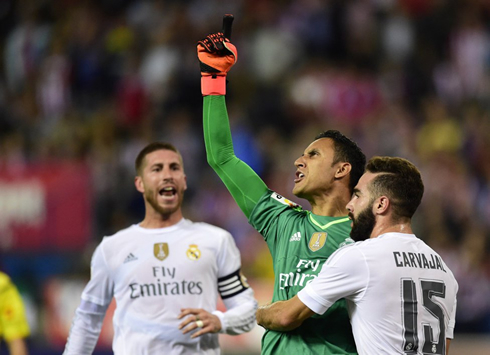 04.10.2015 » Atletico 1-1 Real Madrid. Two points dropped or one pointed rescued? Atletico and Real Madrid clashed in the Vicente Calderón this Sunday night, but at the end of what was a well disputed game, none of the sides were able to claim the 3 points. 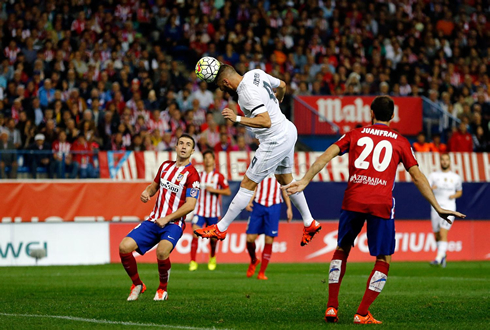 The Madrid derby finished 1-1, with Benzema and Vietto scoring the only two goals of the night. Real Madrid were just minutes away of securing the 3 points and returning to the top of La Liga, but a late equaliser from Luciano Vietto allowed Atletico Madrid to rescue a point and punish the Merengues for perhaps being a bit too defensive-minded. Rafa Benítez's men were the first to score last night, when a great play from Carvajal on the right sideline led to him assisting Benzema and followed by a great header from the French striker. Atletico would still miss a penalty a few minutes later, in what just one of many occasions where they saw Keylor Navas denying them the goal. The hosts' efforts ended up being rewarded inside the last 10 minutes of the game, right after a great run by Jackson Martínez on the left and an empty net finish from Vietto. Real Madrid keeps struggling to beat their city rivals Atletico and after tonight's draw, they now only have 1 win in the last 9 games they've played each other. 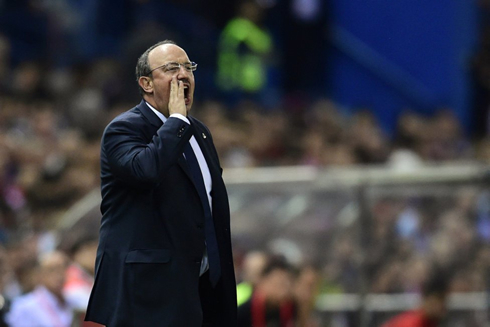 It was the first derby for Rafael Benítez, who seems to have had too much fear when he should have taken some more risks. The Merengues grabbed an early lead thanks to Benzema's goal in the 9th minute, but a way too conservative approach in the second half allowed Atletico to grow and eventually get to the goal they had been chasing the whole game. Contrary to what had been reported in the media during the week, Benítez ended up not having James Rodríguez available for the derby, as the Colombian suffered a relapse and will have to sit out for 3 more weeks. On the other hand, Gareth Bale and Sergio Ramos were both declared fit, but the Spanish centre-back was the only entering straight to the starting eleven in tonight's battle at the Vicente Calderón. Bale started on the bench but still played roughly 25 minutes in the second half, after coming in for Isco. The opener came in the 9th minute of the first half, following a spectacular play from Carvajal on the right wing. The Spaniard got rid of Filipe Luis by outrunning him after a dribbling move, just before sending in a perfectly measured cross into the heart of Ateltico's box. His ball met Benzema completely alone in a very dangerous area and the Frenchman finished it off with a powerful header to put Madrid in the driving seat. It's Benzema's 6th goal in 6 La Liga appearances and he's now alone on the top of the Pichichi table, 1 goal ahead of both his teammate Cristiano Ronaldo and Celta de Vigo's Nolito. Atletico was handed a golden chance to put things level still in the first half, when a double mistake by Sergio Ramos ended up leading to the referee pointing to the penalty-kick spot. The Spaniard started by first missing a pass in a very dangerous area and then, after tracking back several meters to chase Fernando Torres, he managed to get the ball back for a few instants just before a heavy touch compromised everything again. Tiago reached to the ball first and Ramos sliding tackle brought him down inside Real Madrid's box. Fortunately for the visitors, they got Navas in great form and the 28-year old stopped Griezmann's shot. 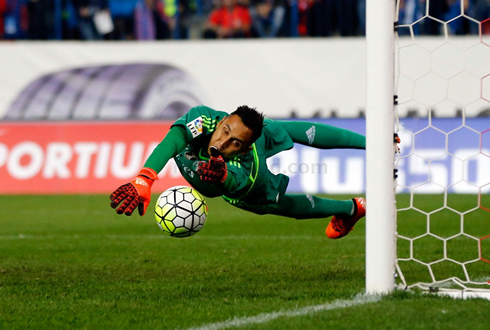 It's 2 out of 2 for Navas this season, 8 in 27 in his whole career (29.6%). After a good performance in the first 45 minutes, Benítez allowed Atletico to start gaining confidence after the break and the Merengues were slowly pushed back on the field. In the 82th minute, Arbeloa was outrun by Jackson Martínez just before the former Porto striker stepped in the box in order to attempt to assist one of his teammates from a low cross. 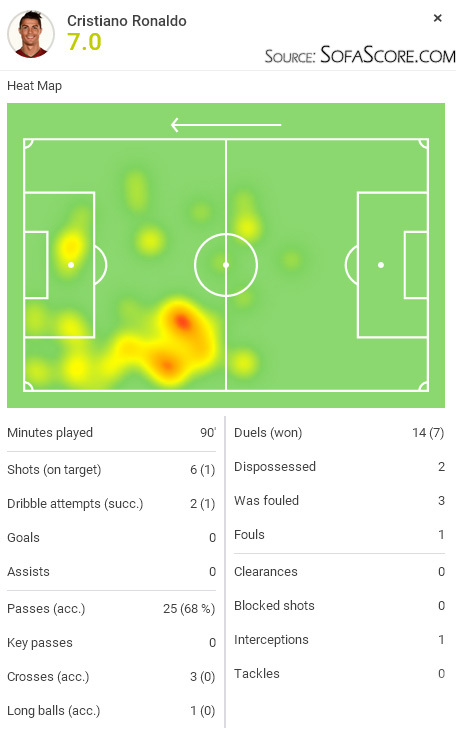 His pass first found Griezmann, who once again got denied by Navas, but the rebound would fall on to Vietto and the Argentinian basically just had to tap it in to an empty net. The 1-1 score didn't change anymore mostly thanks to another great save from Navas already inside added time, but the impression we were left with is that Benítez could have risked a bit more in the second half in order to keep Atletico at bay.